Meissen porcelain started in Dresden, Germany in 1709, by Johann Friedrich Bottger, under the sponsorship of Augustus the Strong, (Augustas Rex), the elector of Saxony. The first pieces of Meissen porcelain were actually red stoneware, known as Böttger stoneware, and first sold at the Leipzig Easter Fair in 1710. In June of that same year a royal porcelain factory in Meissen (commissioned by Augustas), was completed, and the operation was transferred from Dresden to Meissen. Bottger continued to sell the red stoneware from the Meissen Manufactury until he perfected his formula for white porcelain in 1713, at which time all Meissen production switched to the new porcelain formula. Bottger’s new formula and manufacturing process produced such fine and delicate porcelain that he is credited as being the father of all European porcelain. Although continually added to and updated, the Meiseen Manufactury continues to produce fine Meissen porcelain pieces to this day. 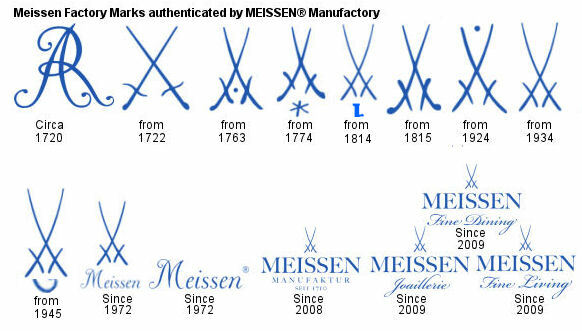 Meissen used a variety of factory and maker’s marks from its inception, but the famous crossed-swords didn’t become the official Meissen mark until 1722-23. Note: The Meissen crossed-swords marks are some of the most imitated and faked marks used. So while they can be indicators in the authentication process – they are not guarantees of authenticity. Those neat and concise illustrations, (above), were created for publication. The actual hand-painted Meissen marks found on their porcelain pieces would look more like the images below. 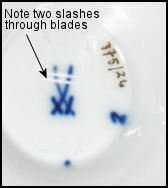 Cautionary Note: Meissen used a system of marking pieces that were either sold undecorated, or deemed inferior by making “slashes” through or besides the crossed-swords – as shown below. This is an actual Meissen quality mark found on a tea service that was listed for $4995.00! Seller described set as exquisite Meissen quality – and the photos did show that the set was gorgeous; to an untrained eye, but even so, it was not up to Meissen’s standards, and there was no mention that the factory mark showed that Meissen deemed the set to be unsuitable for tableware. 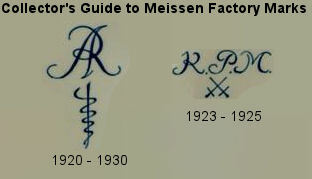 There were at least two other “official” Meissen marks used between 1920 and 1930. The AR monogram was a special mark reserved for objects used by the court of Elector August the Strong, founder of the Meissen factory. Although most documentation dates the AR use only up to 1730, it was also added to pieces produced for the court of his son, August III, who succeeded him in 1733. Occasionally the mark was added to gifts produced for royal visitors. This monogram mark is a reliable date stamp for Meissen pieces because it was only used in 1733-1734. *Although shown here in black, this marking was also a cobalt blue under-glaze mark. Prior to 1720 there were many other artists, throwers, formers, and maker’s marks used on Meissen porcelains, (and also on Bottgers Stoneware), and many pieces carried multiple marks, in conjunction with the official blue under-glazed swords. 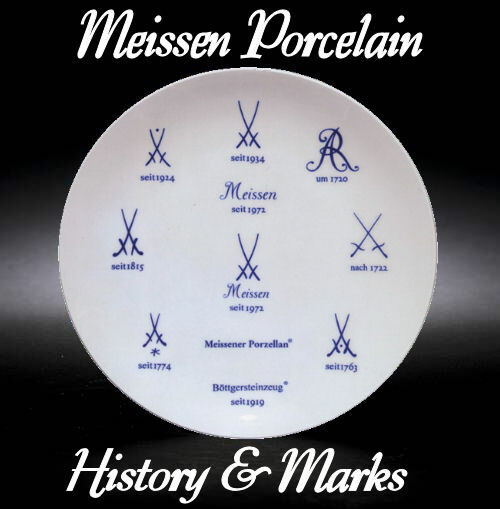 See a detailed history of Meissen Porcelain, factory marks, date marks, artists, molders, throwers, and maker’s marks, by Jim Harren: Meissen Porcelain: German Porcelain – Volume 1. See ALL Meissen Porcelains on Amazon now!